Coming of age, and bringing death with her. Joe Wright's 2011 feature Hanna was a superior blend of efficient storytelling founded upon a clever premise - a trained-from-birth teen fending off assassins - and compelling lead performances from Eric Bana and Cate Blanchett, with a breakthrough turn from a young Saoirse Ronan, capped off by a stunning score by The Chemical Brothers and oozing brutal modern fairytale stylisation. On the face of it, the completed story had nothing more to tell, but it's not wholly surprising to find studios interested in turning it into a franchise, a little like Bourne, only with the added angle of revolving around a teenager. Finding its home on Amazon, the streaming studio already served up the very first episode as a teaser - for 48 hours only - however, it did little more than go through the motions of repeating the first act of the movie's plot, leaving fans eager to see whether the full season can bring something new to the table. Now's the time to gorge on the whole affair, and in glorious 4K UHD too (as usual, buried by Amazon so it is worth remembering to search for "Hanna UHD" before starting to watch) which affords the series pristine visuals a cut above the standard HD version. For those unfamiliar, it's really worth watching the film over and above this, and certainly before this, but the premise, as aforementioned, sees the introduction of Hanna, a teenager who has been trained in the wilderness by her father and who appears to have been the product of some kind of black ops experiments. When a brief wander off the reservation sees her identified by people who - even over a decade after her disappearance - are still on the look out for her, special forces close in and try to capture her and her father. It is hard avoiding the fact that, at least for the first few episodes, all the new Hanna series does is make you want to go back and watch the original film. 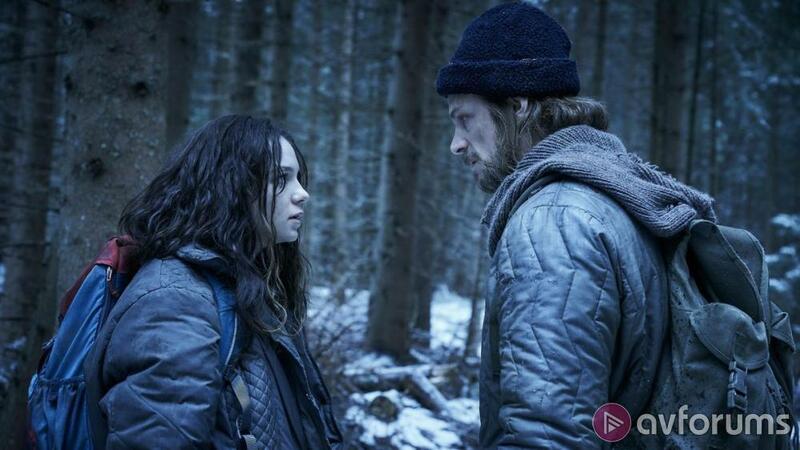 The new casting is strong enough, seeing Joel Kinnaman (Altered Carbon) and Mirelle Enos (Sabotage) reunited after their excellent work on the remake of The Killing, only here on opposite sides, whilst newcomer Esme Creed-Miles makes for a strong enough lead, embracing the innocent vacancy of this undomesticated, almost feral teen, and nicely playing out the Terminator-like imitation work while pretending to integrate with others. Created and written by David Farr - writer of the original Hanna film - and directed by the relatively new Sarah Adina Smith, the series enjoys many of the trappings of the feature, namely at-times stylish direction (albeit without the fabulous fairytale themes) and a sporadically impressive score punctuated by some solid song choices. The trouble, as with the narrative itself, is that it all feels a little diluted - visuals, soundtrack and story - essentially using the movie's plot as the backbone across the entire 8 episodes and adding a commensurate amount of padding to allow for the expansion from two to eight hours. This would be fine, but it's hard to justify these added plot dynamics, with none of the characters really fleshed out despite the added screentime, and the new plot beats and added arcs merely emphasising elements that were already covered - and far more efficiently. About the only parts that really draw you in are the scattered flashback sequences detailing how Hanna came into existence, and the expanded conflict between Kinnaman and Enos, whose shared screentime is a high point, but tension is fleeting and appears to dissipate almost as soon as it has been built up, cursing rather than rewarding the longer format. Action is surprisingly sporadic too (it takes three episodes to get to a decent setpiece), instead seeing Hanna reframed as a more complex spy thriller with scattershot coming of age / fish out of water 'comedy' flavouring thrown in for good measure. Thankfully, by the halfway point, we eventually appear to make it into moderately new territory, but that is still a long wait for some, likely really only rewarding those prepared to binge watch the show over a weekend and, even then, still largely ending up circling the same milestones of the original. For many, the show will perhaps not be substantially different enough (or complex enough, or tense enough) to warrant the long form storytelling, and even those unfamiliar with 2011's Hanna may not stick with it for the protracted duration, likely jumping off before anything significant has even happened. For those who stick with it, there are modest rewards, affording considered portrayals of betrayal and bloodied conscience (Kinnaman may not trump Bana, but Enos gets a less one-dimensional role than Blanchett), eventually building to a somewhat effective climax. But is that enough? The best thing Hanna has going for it is a chance to tell a story beyond the confines of what we already know, so it's a shame they didn't just get the original plot over and done with in the first couple of episodes, instead only leaving fans with the hope that this gets another season so that it can forge its own journey. Write your Hanna Movie review.